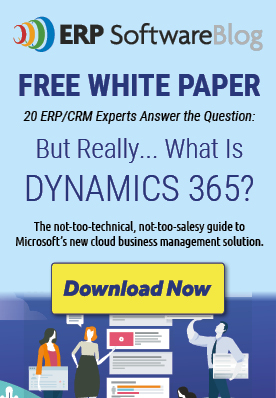 October 28, 2015 by iCepts Technology Group, Inc.
Microsoft Dynamics NAV 2016 has just been released with new ERP functionality in mobility, business insights and cloud services for Small to Mid-Sized Organizations. Microsoft continues its commitment to making investments in their ERP Solutions and planning on a determined “Roadmap” for new product releases. NAV continues this journey with NAV 2016. This post will highlight the Financial Management ERP Features in Microsoft Dynamics NAV 2016. Cash Flow Forecast: Forecast provides a prediction of how a company’s liquidity—cash and other treasure positions—will evolve over time. It consists of two things—cash receipts and cash disbursements—the money you expect to receive and the cash you expect to pay out—plus the liquid funds you have available. These elements together show you a direct cash flow forecast. Multiple Currencies: Manage multiple currencies throughout the system, including payables and receivables, general ledger reports, resource and inventory items and bank accounts (when integrated with the Cash Management features). Enter exchange rates and convert currency in full compliance with euro legislation (including “triangulation”) in the European Monetary Union (EMU) countries. Triangulation is the required method of currency conversion during the transitional period of the euro. Perform currency conversion according to exchange rates that are stored and maintained in the exchange rate table. Set up a currency in the exchange rate table and specify the format so that amounts will always be shown in the correct format on all forms and reports throughout the system. Enter exchange rates for a date or for a period in the exchange rate table. Calculate the exchange rate associated with the date on the transaction for each conversion of a currency amount to a local amount. Save historical exchange rates in the exchange rate table to keep track of fluctuations over a period of time. Transact business in any number of currencies for any customer and vendor. For example, companies can issue an invoice in one currency and accept payment for that invoice in a different currency. Manage currency conversion dynamically and help ensure efficient processing of exchange rate updates. Store details of transactions involving receivables and payables in local and foreign currencies so that aging and reports for receivables and payables can be printed in local or foreign currency. Use the Exchange Rate Adjustment option to adjust receivables and payables and post unrealized gains/losses to the general ledger. Bank Account Management: Create, operate and manage multiple bank accounts for catering to your diverse business needs and across different currencies. Electronic Payments and Direct Debits: Create payment proposals based on vendor documents and generate bank payment files in ISO20022/SEPA format or use the Bank Data Conversion Service for generating the appropriate electronic payment file for your bank. Easily keep track of the payment export history for your electronic payments and recreate a payment file whenever needed. Apply payments with simple streamlined process to mark and process the desired transactions. Create direct debit collections to get the money directly from your customer’s bank account and generate a bank direct debit file in ISO20022/SEPA format. Reconciliation of Incoming and Outgoing Bank Transactions: Import bank transaction data from electronic files sent from your bank in ISO20022/SEPA format—or use the Bank Data Conversion Service for other file types. Apply the bank transactions automatically to open customer and vendor ledger entries and create your own mapping rules. Review the proposed applications and account mappings in an easy and intuitive way. It is possible to modify the algorithm behind the record matching by modifying, removing or adding rules. Check Writing: Generate Computer printed checks with a unique number series for each bank account. You can specify on the payment journal line whether you want this payment to be made with a computer or a manual check. This assists internal control by ensuring that the computer check is actually printed before posting the payment. Check printing comes with flexible user options, such as voiding a check, reprinting, using check forms with preprinted stubs, testing before printing, and also the possibility to consolidate payments for a vendor into a single check. Bank Account Reconciliation: Import bank statement data from electronic files sent from your bank in ISO20022/SEPA format—or use the Bank Data Conversion Service for other file types. Reconcile your bank statement data automatically to open bank account ledger entries and keep track of all bank statements. Cost Accounting: Cost Accounting provides an efficient way to control the company’s costs by providing visibility and insight into budgeted and actual costs of operations, departments, products and projects. Cost Accounting synchronizes cost information with the general ledger and then allocates that information to different costs centers and cost objects. Transfer costs from the general ledger. Enter and post internal charges and allocations directly in the Cost Accounting Cost journal. Predefine recurring cost allocation rules on cost allocation cards and execute in a batch job. Create cost budgets and transfer cost budget entries to actual entries.